CYMA Employee Self-Service allows online employee access to personal information, check history, W2's and more. 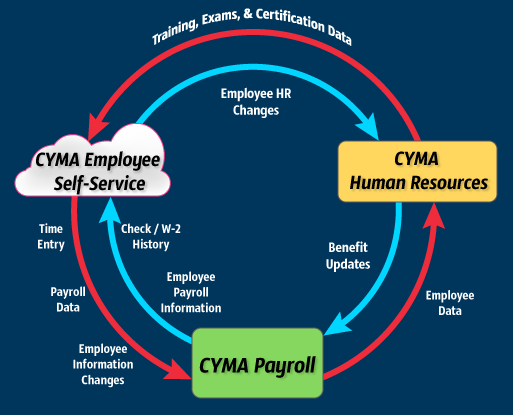 CYMA’s web based Employee Self-Service helps companies drastically reduce employee payroll costs and increase worker productivity through secure, anytime/anywhere payroll information access and (optional) time entry for your employees and supervisors through any web browser. Authorized employees and supervisors can self-answer many payroll questions, review demographic information, review/print their deposit advice, and print W2's. Employees can optionally enter time by period, day or advanced daily entry including job, department and transaction classification information. If needed, each employee can have a different entry type. Supervisors can optionally enter or approve employee payroll by period, day or advanced daily entry including job, department and transaction classification information. Supervisors can be limited to review only direct reports and other security restrictions. Reduce Payroll Distribution Costs: Employees can access W-2's and check stubs reducing the total paper and labor output. Organize the time entry process: Employees can optionally enter time by period, day or advanced daily entry including job, department and transaction classification information. Supervisors can optionally enter or approve employee payroll. Reduce common, repetitive employee questions: Employees can easily review vacation and sick time accrual, 401k contributions, emergency contacts, and more. Improve company communication and compliance: HR Forms allows custom forms to be delivered online to the HR or Payroll manager. CYMA controlled company and event Calendars keep everyone on the same page in an organization. Empower Supervisors to make timely decisions: A series of Supervisor Queries offer credential management, pay & review dates, employee earnings and more without the need for the controller, payroll administrator or other CYMA operator.